I HAND WROTE, ILLUSTRATED, AND NARRATED A BOOK CALLED RUMPLE BUTTERCUP: A STORY OF BANANAS, BELONGING, AND BEING YOURSELF! ALSO, ONE TIME I HELPED UNEARTH A PREHISTORIC DINOSAUR IN A SMALL TOWN IN CANADA BUT THIS BOOK HAS NOTHING TO DO WITH THAT. thank you so much for all the marvelous and thoughtful questions guys! sadly I have to get out of this bathtub and into a giant green Rumple Costume so im not late for the next stop on the tour. Sending you all my love! HOW DO YOU TURN OFF THE CAPS KEY? youre my favorite character on Criminal Minds. And thats hard to say with a fantastic cast like that. If you are alone at home. Saturday morning. Your plan is to stay at home most of the day. What does Mattew Grey Gubler prepare for himself for breakfast (the ideal perfect breakfast). And what do you do while eating that breakfast? Do you have any advice for someone who wants to do a lot of things but also has a hard time doing things because of mental illness? I want to get far in life but my brain doesn’t want me to. im so sorry to hear that, but I like to think that everything that makes us different is also kind of like a super power that gives us unique abilities or magical perspectives that other people don't have. your brain loves you, and I think it wants you to be as happy and "go as far" as you possibly can, just maybe in a very unique and original way. how do you take your coffee? this was asked during the live signing yesterday, but you just went on a cute tangent about how you've never said no to a cup of coffee and didn't answer it ahaha! hahahha I like how persistent you are with this question! I was so hot in that costume that my mind was flying everywhere in an attempt to stay alive! I LOVEEEEEE COFFFFFFEEEEEE I actually take it with a little bit of honey and a tiny bit of heavy cream. I also make it strong enough to singe a brick. Please- go on about the dinosaur you helped unearth? Consider my interest piqued. it was one of the coolest experiences of my life. I got to go to this tiny town in Alberta Canada and help unearth a GIANT pachaseflarinosaur (check the spelling on that) with Philip J Currie. Hi Matthew! I love you and your extraordinary way of seeing the world so much. I wish i could meet you one day. My question is: What is Rumple's biggest wish? awwwwwwwwwww I love this question! how does a girl catch your eye??? also do you remember anyone specific from yesterday? Why does Reid wear his gun in a different position than everyone else? Always been curious about this! the director part of my brain told me to wear it like that because I wanted him to always look slightly awkward with gun, like it doesn't quite belong on him. but the actor "Reid" part of my brain wears it like that because that is actually the way the best gun fighters used to wear their guns. the reason for this is bacuse when you pull it out from that angle you are naturally a thinner and harder to hit target. beacause you are sideways. (I can demonstrate better in person) I think Reid loves this fact, and also loves the history of it. What is your favorite hidden gem from your hometown? Do you think JJ really loves Reid or was it actually just for show? my hope when we shot that scene where Reid asks her if she was lying or not, that 50 percent of the audience felt one way and 50 parent felt the other. What was your favorite episode to film and why? will you be doing a bigger book tour soon? i’d love to meet you and have been a fan for so long ! oh man im so excited about it!!!! You were phenomenal in hot air and my mother and I are huge criminal minds fans, my question is what are your current projects and passions ? Anything neat coming up? thank you! tell your mom hi for me! I have a new book im working on, some fun films I plan on making with friends, a movie im going to direct, and IM BRINGING BACK NEW EPISODES OF MY UNAUTHORIZED DOCUMENTARIES from a while ago. if you don't know what they are google Matthew gray gubler the unauthorized documentary. im so exited about this! I actually just set out to write a book that I wanted to read, and this was it! What a is the very best cheese? do you have a favorite kimono? What was it like, playing such an iconic character like Spencer? such a good question!! he is roughly the same height as an 10 year old in converse. which do you prefer most: writing, directing, or acting? what was the most interesting part of the book writing/creating process? so great! im currently in a bathtub, last night was amazing and I was so touched by how many sweet people came all the way out to celebrate Rumples Birthday. Our signing at the bookstore ended up going 4 hours longer than anyone expected and we didn't close the book store until 1 am. but most importantly everyone there was so kind hearted and sincere. If you had to choose a single condiment to use for the rest of your life, what would it be and why? I love all the Rumple posts so much! How has your book tour been going so far? hopefully soon. I want to go everywhere in the word!!!! Question for Rumple: What’s your favorite snack? What are your thoughts on hummus? Also, what's inspired you to write Rumple Buttercup? Which character traits do you share with Rumple? Will Rumple ever come to Europe? Of all of the characters you've played in movies and tv, which is the most like Rumple? 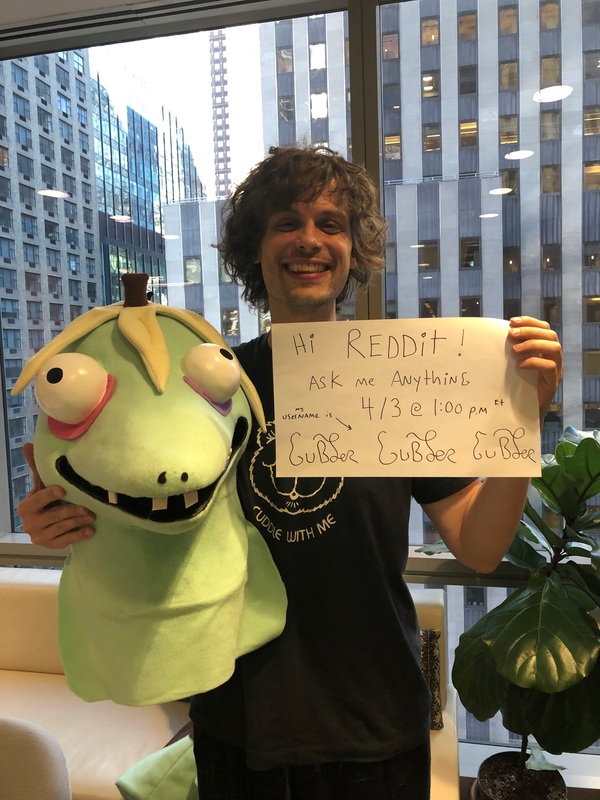 I had this massive realization recently that while every character I play or create is very different, rather its Spencer Reid, or Rumple Buttercup, or Raymond from suburban gothic, or Simon the chipmunk, or Kyle Orfman in life after Beth, they are all outsiders who don't fit in with the normal world. I feel very humbled and honored to get to continue to create/play people like this because my only goal in everything I make is to help outsiders feel like they belong.